Welcome to SØ4R - Western Sahara 2009 DXpedition web site, where we'll give you more information about our DXpedition. The operation will be on the air from 12th to 17th April 2009. 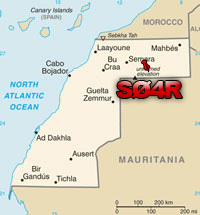 SØ4R ,Western Sahara 2009 Operation, has been approved for DXCC Credit.